Croissant! What’s better than a buttery, flaky, warm out of the oven croissant? 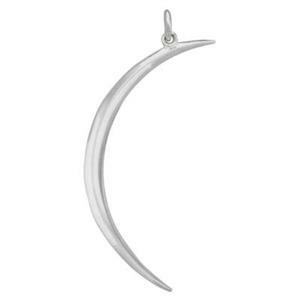 A Sterling Silver Crescent (Croissant) from Halstead. The Croissant pastry gets its name from its Crescent shape. Ours is a large, bright, cast, beveled “(“ charm. Stunning alone as earrings – or hang one the right way “(“ and hang another the other the opposite way “)” and you can parenthetically showcase a different jewelry piece in between them. Brilliant focal for celestial themes or moon lovers.